If your team lives in Slack like we do, our latest automation is going to knock your socks off. 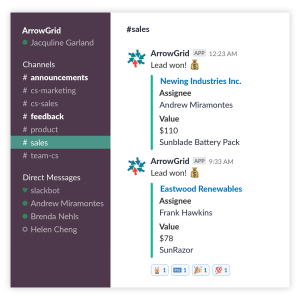 Nutshell’s Slack integration lets you and your team keep tabs on your active leads within the Slack channels where you’re already communicating. Accelerate your sales cycle: Get notified as soon as you receive new leads or when leads advance through your pipeline. Work where you work: Stay informed and productive without having to constantly switch between Nutshell and Slack. Our Slack integration also unfurls Nutshell links, so when you share a lead, company, or person link in Slack, we’ll display the most relevant details associated with it. You need a paid Nutshell account and a Slack account (free trial available). To learn how to set up Slack notifications for when your leads are created, advanced, won, or lost, visit our Help Center.